After a day at kindergarten, Grace Kostyk unwinds at home with a game of Wii or a little TV before dinner. She jokes with her mom about “practicing her karate” and turns her mouth bright red with a heart-shaped Valentine’s Day lollipop. Grace’s mom also kicks off the evening by feeding her a spoonful of pudding, but not to spoil the 6-year-old’s dinner. The sweet treat is laced with a crushed chemotherapy pill Grace requires to help fight acute lymphoblastic leukemia. Grace Kostyk will serve as honorary starter for GCU's Run to Fight Children's Cancer on March 10. The common childhood cancer forces Grace to undergo three- to four-day hospital stays and to endure spinal taps to make sure the cancer is not spreading to her brain. She lost some of her strawberry blonde hair, but cracks jokes and smiles as regularly as she has to take her medicine. To Grace, life is more than dreary hospital visits and constant prognoses for her future. She’s looking forward to shouting “on your mark … get set … GO!” as the honorary race starter for GCU’s Run to Fight Children’s Cancer on March 10. The event is the spring version of the run hosted by the University last fall. The inaugural 5K and 10K races in October, conceived by GCU’s executive director of communications and public affairs, Bill Jenkins, a cancer survivor, raised $30,000 for the local non-profit Children’s Cancer Network. The network is dedicated to helping families of childhood cancer patients. The event includes a short Survivors’ Walk, where runners from the main event join in with cancer survivors. Grace’s mom, Sue Kostyk, said she hopes her daughter’s role as a race ambassador will help others keep their faith. She believes Grace’s affability and magnetic nature will resonate with parents whose children are struggling with more serious forms of cancer. “With her personality, and the way she draws people … I don’t think God put her here to be taken away right away,” Kostyk said. Acute lymphoblastic leukemia is the most common form of childhood cancer, according to the National Cancer Institute. The disease, known as ALL, is an aggressive form of cancer developed when a child’s blood and bone marrow are overrun by undeveloped white blood cells that limit the growth of healthy cells. Grace still faces one more hospital stay and additional recovery beyond that. But her parents say she’s about 99 percent cancer-free. In addition to Sue and her husband, Bob, Grace has three older sisters (Ashley Williams, 23; Jessica Kostyk, 19; and Nicole Kostyk, 16) helping her fight cancer. 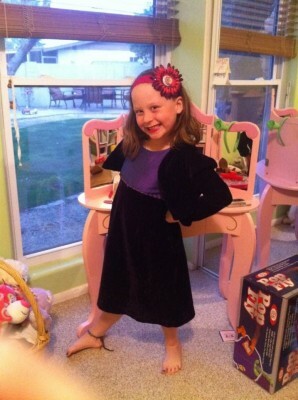 Grace attends Lookout Mountain Elementary School and lives with her parents in north Phoenix. The family is collecting donations by selling pink “Amazing Grace” wristbands, which they hope will raise more than $1,200 to help Children’s Cancer Network. Patti Luttrell, a GCU College of Nursing adjunct professor, serves as executive director of Children’s Cancer Network. Her husband, Stephen, joined her in founding the non-profit organization in 2004 after their son, Jeff — now 23 and cancer-free — was diagnosed with the same form of cancer as Grace. Like the Kostyk family, the Luttrells received strong support from friends and family through Jeff’s treatments. But many families struggle to connect their ill children with the same support network. Others face issues with insurance, other bills or simply putting food on the table. Children’s Cancer Network also provides an educational component for families, in addition to health and wellness programs for childhood cancer patients, such as helping teen cancer patients get fitted for wigs. The organization promotes scholarships for survivors and, every two years, hosts a Survivorship Conference with experts in various areas of health care or cancer prevention. Luttrell said she was thrilled with the impact of the fall run and that she hoped a similar outpouring of support would benefit children like Grace next month. ”It’s such an inspiring day, we’d love to see more and more people participating, having fun and working together to raise money to fight children’s cancer,” Luttrell said. To enter the Run to Fight Children’s Cancer, which has 5K and 10K races that start and finish at GCU Arena, go to www.runtofightcancer.com. Contact Michael Ferraresi at mikeferraresi@gmail.com.